The Clockworx Hole Slope Indicator is the first training device to help golfers properly read the break of the green at the hole and significantly improves scores! 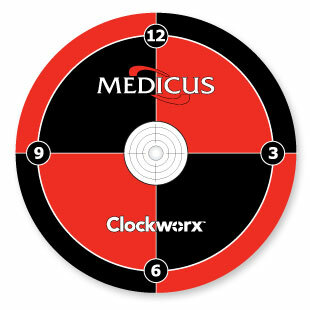 The Medicus Clockworx Hole Slope Indicator (HSI) will help you accurately identify the high side, low side, and slope of every hole so you can practice putting with precision and improve your green reading ability. The Clockworx Putting Hole Slope Indicator is the only product of its type on the market and has already shown great success at improving putting scores. This is because it is not based on some magical remedy, but on physically training the eye and body to assess the green's incline through habitual practice. Like anything else, putting is a skill that must be learned through time and careful study, and the Hole Slope Indicator works as a key assistant in doing so. READ - The HSI fits in any golf hole and is flush with the green. The markings around the HSI bubble indicate the high and low points of the hole and degrees of slope. Rotate the HSI until the bubble hits the 12:00 crosshair. MARK - Once you mark the key points with the included markers, remove the HSI and begin practicing. CALIBRATE - Start by putting at the 6:00 position. This is a straight uphill putt and will help you gauge if your putting stroke is proper. A missed putt to the right or left indicates a problem at impact - not the break of the green. PRACTICE - Begin putting "around the clock" at all positions. This allows you to correctly judge the break of the green at the most critical point of the ball's path - and help you aim at the proper quadrant of the hole.